The Project was founded in the University of Manchester in 1995 and moved to the University of Liverpool in 2002. Since 2013 it is an Independent Research Project. There is a great deal of information about the system in existence but either outside the public domain or in an unstructured form that is difficult to access. This may concern sites that are no longer visible, are now built over and destroyed, or which are just no longer so well preserved as they were when earlier writers saw them, and there are also old records of stray finds of archaeological material and the like. We have been tracking down this data through old maps, old farm and estate records, newspaper reports etc. There is also a considerable body of real archaeological work which has never been fully published. To try to correct this we have been leaning (heavily) on any excavators who are still alive to publish their work, if needs be with our help, whilst tracking down the records of dead workers in order to publish their results ourselves. Many of the Roman and native sites in the area are not now visible on the surface, but many do appear on air photographs in the right crop or lighting conditions. There are considerable air photo archives for the area, many of which were taken with specific archaeological intent. We have been studying all these, but many of the features detectable from the air are extremely short lived, e.g. 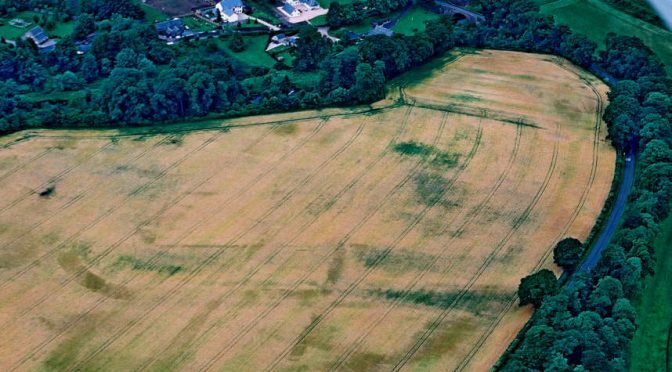 marks caused by differential soil drying after ploughing, and so national air photography bodies are most unlikely to have an aircraft in exactly the right place at the right time to record them. We have thus been recruiting local amateur pilots from a number of small airfields in the area to take pictures especially for us and encouraging them to carry a camera on all flights. We are also planning our own air photographic flights in the future. Lastly, we have conducted a topographical survey which has allowed us to determine the signalling arrangements of the frontier. Roman long range communications used visual techniques, mainly based on fire, and so it was vital to discover which sites could see which others, from their full original tower heights (c.10m), in a landscape which is today often heavily wooded. In addition to this, we have an extensive surface survey program. This takes the form of geophysical surveys (magnetometry, resistivity etc) which can detect buried archaeological features without disturbing the soil, along with field walking programs, which simply involve walking over ploughed fields looking for concentrations of material which might indicate a buried site, e.g. Roman pottery scatters, stone bands, which might represent a ploughed out Roman road, etc. So far, this has involved us in excavating 15 sites, including three Roman watch towers, two Roman fortlets, a Roman road, several native homesteads etc and more are planned. At each site, as well as the normal archaeological work on the site itself, samples of ditch silt etc are taken for environmental analysis, which should over time build up a picture of the ancient landscape and the Romans’ impact upon it. So far, we have many localised results, but the most significant finding for the system as a whole has concerned dating. The conventional wisdom until recently has been that the system was only in use for a very short time, perhaps only a year or two. The reason for this is that the Romans are known not to have got to this area until 79 or 80 AD, whilst the latest coins found so far date to 86. This has resulted in a very short chronology being adopted, as archaeologists have assumed that the pull back to the later line of Hadrian’s Wall must have started in 86 or immediately thereafter. Our own work has, however, revealed a consistent pattern on the Roman military installations of sites built from very substantial timbers (up to 40cm diameter) needing to be rebuilt over time at least once and in some cases possibly twice. This obviously implies a much longer occupation, although exactly how long, we are not yet able to say.